Mountain View, Calif. – February 24, 2014 – Speck, the leading designer of award-winning, mighty slim protective cases and covers for smartphones, tablets and laptops, today announced its full lineup for the Galaxy S5 announced earlier today by Samsung at Unpacked 5 in Barcelona. 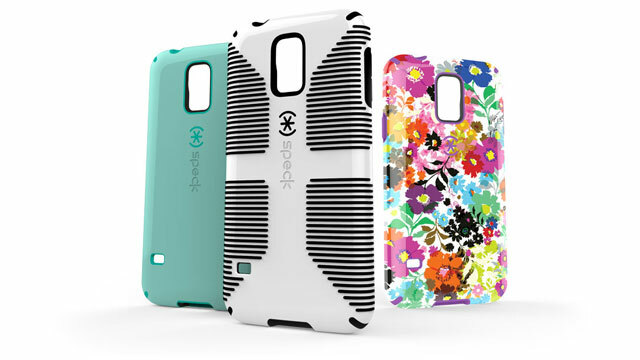 Through its SMAPP (Samsung Mobile Accessory Partnership Program) licensing agreement with Samsung, Speck is releasing three of its most popular case designs, expertly engineered specifically for the Galaxy S5. Each case combines style with multi-impact protection in a sleek, dual-layer case to complement the new, slim design and larger glass screen of the Galaxy S5. • CandyShell for Samsung Galaxy S 5 ($34.95) is a sleek dual-layer case that features a hard outer shell to guard against impact and a soft, rubbery interior to absorb shock from bumps and drops. CandyShell also features a raised edge to protect the screen and rubberized covers to shield buttons. • CandyShell Grip for Samsung Galaxy S 5 ($34.95) is the ideal case for texting and gaming, giving users a secure hold with extra grip. It has the same multi-impact, dual-layer protection as regular CandyShell and features raised rubber ridges to add a no-slip grip that frequent texters love. • CandyShell INKED for Samsung Galaxy S 5 ($39.95) is a scratch-resistant CandyShell wrapped with high-resolution graphics in vibrant colors for a bold new look that doesn’t compromise on protection. CandyShell Inked cases are specially crafted to achieve sharp graphics that won’t fade with a durable, anti-scratch coating. Cases will be available in black, white, and a collection of new Spring colors and patterns. They will be available at www.speckproducts.com. SMAPP (Samsung Mobile Accessory Partnership Program) enhances Samsung Mobile’s accessory portfolio by working with highly qualified industry experts approved by Samsung Electronics Co., Ltd, a global leader in telecommunication, digital media, digital convergence technology and semiconductor. SMAPP addresses customers’ increasing needs for value-added accessories for Samsung Mobile’s cutting-edge technology; delivering innovation, value and high customer satisfaction through its partners’ expertise, design and premium portfolio. SMAPP accessories are presented with a licensed “Designed for Samsung Mobile” logo on the package, signifying it was designed to connect to Samsung mobile devices, and has been certified to meet Samsung performance standards.